Next to the castle’s tilting ground, now the bowling green, is where I meet two middle-aged newly weds, in casual clothes. Both have a small bunch of white roses and they share swigs of champagne from a bottle. Two photographers accompany them around Castle Hill, Castle Banks, Castle Precincts. The four of them hover by Thomas Paine’s memorial plaque, which lies at the foot of a cherry tree. It is 11.35 in the morning, on a Wednesday in January. Wedding party chatter mixes with the busyness of sparrows and I conjure the past pounding of hooves of a joust. At the bottom of the hill, where the castle ditch ran, is the intriguing Commercial Passage. 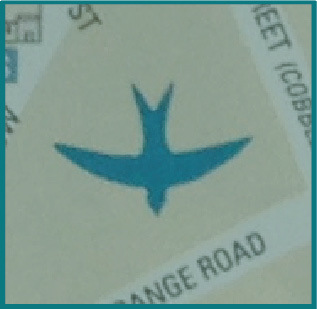 This narrow connector, between a brewery building and The Friar fish-and-chip shop, draws one towards its tight geometries. From the top of the passage you can see through to the Lewes Arms, that my friend had recommended, and back up the hill to the castle. I’m on my way to the chalk cliffs on the easternmost edge of Lewes. I take a bag of chips with me. The sign swinging outside the Snowdrop Inn shows two men clearing snow from a hilly landscape. This must be a place that cement workers would have come to after work for refreshment. 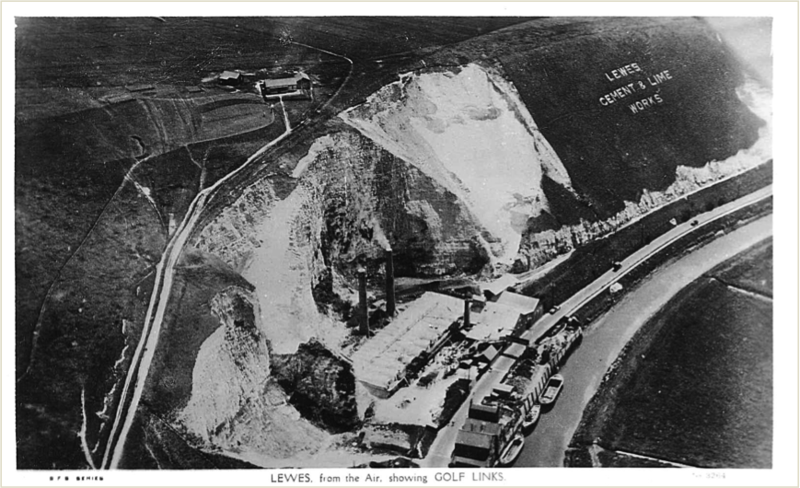 The pub crouches underneath the chalk face that used to feed the Lewes Cement and Lime Works. Chalk would be quarried and then burnt into lime, to make cement and fertilizer. Atop the cliff are the golf links and as I look up I imagine the odd ball sailing over into the high void above me. Instead, in this airy space, raw-flanked with white walls, corvids rally and cry. I film them circling with my phone. This gap, I sense, is where the kiln chimneys once stood and smoked. I look back at the photograph I have with me to see where I might be. The message on the grassy slope seems to have been carved out for an airman to pick out or for God to gaze upon. Beyond here I cross the road to the Cliffe Industrial Estate. Here are HB Ingredients, Sussex Skips, RF Solutions, Insight International Corp, Peter’s Food Services, Monkey Bizness. From the corner of the estate’s car park, I find the Grey Pit quarry, which is now announced as a site of special scientific interest from behind broken fence work. The old works railway line traces a path past the mattress and the shopping trolley of an underpass to a ragged open landscape of gorse. Here the past presents itself to me, charcoal and crumbling cretaceous deposits crunching under foot. Weekend scramblers and BMXers have reclaimed this excavated land, creating pleasing muddy tracks across the part-flooded vista. Once, the chalky calcium remains of this place nourished cereal fields of the Sussex Weald and gave material to the Peacehaven bungalow boom. My photograph, I find, contains the rhythms of a hundred million years of sedimentation of bivalves and ammonites, fish and lobsters, pressed to rest until reactivated.